The Camino de Santiago de Compostela is a traditional Catholic pilgrimage route across northern Spain to the city of Santiago de Compostela. Here the reputed remains of the apostle Saint James lie. This route has been followed by pilgrims for over a thousand years. Today many, like myself, who are not Catholic, walk the route for our own spiritual reasons. My friend Diana and I, walked from just over the French border at Saint Jean Pied de Port to Santiago de Compostela and then on to the coast at Finisterra (the end of the Earth). It was one of the most amazing things I have achieved in my life. Everyday something new presented itself. We met wonderful people and had some amazing experiences. I am delighted to be able to share some of these fantastic times with you through my web site. 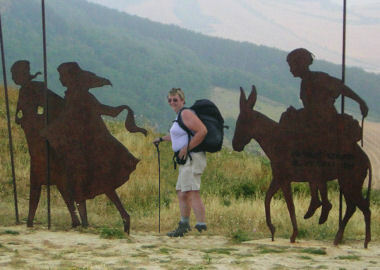 I hope my experience inspires you and others to walk the Camino also. An overview of the journey along the Camino: What is the Camino? Where we stayed etc. Day by day list of where we travelled and the distance walked, with links to each days activities. Nearly 300 pictures of the journey along the camino Share. Sue's memories HERE The best and the worst accommodation. Food ranged from wonderful communal meals: stew and bread, to yesterday's stale bread and sun melted cheese. At the end of the Camino you receive the official Compostela certificate. Also along the route, you obtain a stamp in your pilgrim's passport daily. Details of where to obtain further information about completing the Camino.